Monday, February 23rd – At the MMMMM (Madison+Main Monday Morning Meeting) I was able to brag on my lovely, talented first-born daughter Hattie, who led her show choir with a win in the Clover Hill Mid-Atlantic Invitational and super proud that she was named Best Performer. The trophy has been sitting on the dinning room table like a centerpiece all week. #proudpapa. On Monday we welcomed Caroline Lea from Trinity High School who was forced to spend a terrible, real world week at Madison+Main. Just kidding. We were delighted to have Caroline as a temporary Madison+Main-iac this week. Unfortunately I didn’t get to spend any time with Caroline because Casey and I were working on site with the Dragas Companies in VA Beach, and had a great meeting with Sally Horvath and Breyana Baggett (ironically Breyana spent some time at Madison+Main shadowing us a few years ago and now we get to work with her). #smallworld. Tuesday, February 24th – Any day we assemble the team for a Creative Concept meeting on behalf of a client is a fun day and Tuesday we managed to sneak in two sessions… one for First Bank and one for Advanced Wellness Centre. And in between, we had a meeting over at CowanGates with two of my favorite people, Managing Partner Neil Cowan and Administrator MaryAnn Hartzell. Also we send congratulations this week out to Melanie Friend and Scott Stovall, who were recently named 2014 “Rising Stars” by Super Lawyers. This new online video for Village Bank should cheer you up. Check it out! The Walt Disney Company released trailers for the movie Frozen six months prior to the film hitting cinemas, and then it did a very unusual thing; when kids and parents posted their own versions of the trailer and tributes to the music, Disney did not ask YouTube to take the content down, but instead “let it go.” Word-of-mouth marketing is especially powerful and can be driven by video. Frozen is the most successful animated film of all time, grossing almost 1.3 billion dollars worldwide. Wednesday, February 25th – On Wednesday we hosted our friends from Embrace Richmond at the office, where we presented a wide variety of creative concepts and their new brand identity pieces. They were thrilled with the work, which always brightens my day. I took a brief pause to reconnect with Mary Warren, Membership Relations Advisor at the Retail Merchants Association. Mary updated me on lots of cool things happening at RMA and she picked up the lunch tab at popular RVA soul food spot Mama J’s. #mmmgood. If you are a retailer in RVA or you do business with retailers in RVA, you need to be a member of the RMA. Call Mary directly at 804-272-3915 and she can help you. 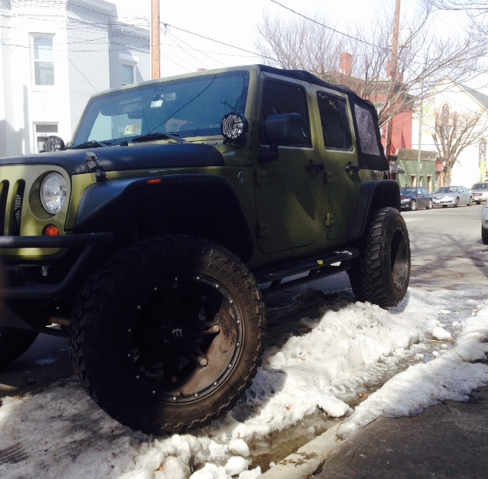 When you drive a Jeep, you can always make your own parking spots. Thursday, February 26th – Do you want to build a snowman? No. But apparently dozens of friends and regular readers of the Weekly Report wanted me to drag them behind my Jeep through the snow. Last weeks video, which you can see here, generated a bunch of e-mail requests and over 3,000 video views. #shrednecking. We got 7 more inches of snow at my house Thursday, which meant the kids were out of school and I had to work from home. While I was on a conference call with our partners (Burson Marsteller & Alliance Group) and our clients at Virginia Energy Sense talking about ways to spread the message regarding energy efficiency, I witnessed my kids walk out into the snow, leaving the door open, the lights on and the TV blaring in the living room. We are going to work together to conserve energy this year, and I guess we should target the message towards teenagers. Friday, February 27th – Two years ago, on Wednesday, February 27th of 2013, we placed a small 5×7 inch dry erase board on Lindsey Durfee’s desk. We nicknamed it “The Durf Board.” On every work day for the past two years, we have written small messages on the board. That means we have written over 500 clever, witty posts, and we have now completely run out of ideas. So we need your help… go to Facebook or YouTube and tell us what to post on the #durfboard. I just finished reading What Great Brands Do by Denise Lee Yohn. I think it might be the best marketing book I’ve read in a couple years. If you are interested you can get one here.